The cost of employer-sponsored insurance premiums grew by 4 percent this year, continuing a trend of relatively modest growth, but the share of medical costs patients pay when they get care continued to rise far faster, according to a survey released Tuesday by the Kaiser Family Foundation and Health Research & Educational Trust. 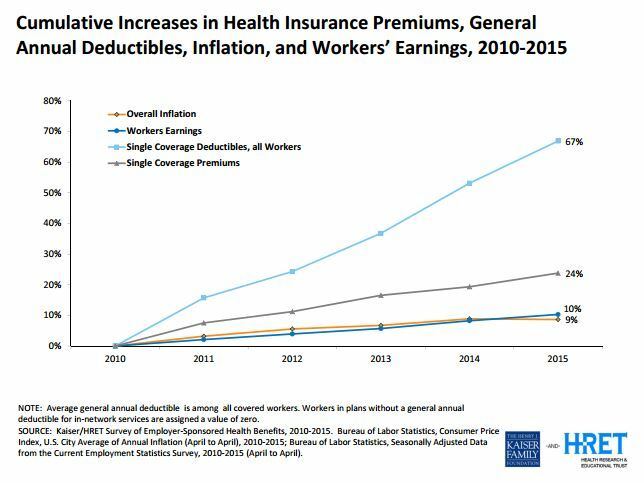 Since 2010, the study authors wrote, there has been a sharp increase in the percentage of workers with health plans with deductibles – which require members to pay a certain amount toward their care before the plan starts paying – and the size of those deductibles. 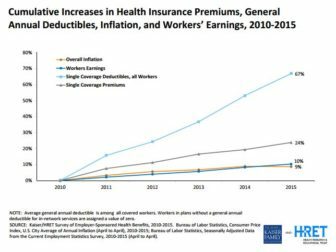 The result has been a 67 percent rise in deductibles since 2010, far outpacing the 24 percent growth in premiums, the 10 percent growth in worker wages and 9 percent rise in inflation. “But it’s also a health cost slowdown which has been, I would say, all but invisible to consumers,” he said, adding that deductibles and other forms of cost-sharing have grown far faster than wages. A major question facing the employer market is whether premium growth will speed up as the economy improves, as has happened in the past, the two organizations wrote in a report on the survey. At the same time, they wrote, a tax on high-cost plans set to take effect in 2018 will probably prompt employers and insurers to seek savings. “These competing pressures may well lead to plan changes such as tighter networks, stricter management and higher cost-sharing as employers and insurers struggle to contain these higher costs,” the authors wrote. The employer-sponsored insurance market has remained relatively stable overall despite the changes required by the federal health law, the authors wrote. But many employers are making or considering changes to their benefits that could bring significant changes in the coming years. Those include emphasizing wellness programs, assessing employees’ health risks – in some cases using biometric screenings that measure blood pressure, weight and other factors – and considering using private exchanges that allow employees to pick their own plans with a certain amount of money provided by the company. Some experts liken that shift to the move from defined-benefit pensions to defined-contribution plans like 401Ks. So far, only 2 percent of workers with employer-sponsored coverage from companies with more than 50 employees used private exchanges, according to the survey – but 17 percent of companies of that size said they’re considering using private exchanges. “If these exchanges succeed, they have the potential to move some of the decision-making about benefits away from employers, which could transform how employees and employers interact over benefits,” the report said. Employer-sponsored coverage remains the dominant form of insurance in the country. Census estimates released last week indicated that 55.4 percent of U.S. residents had coverage through an employer last year (in Connecticut, it was somewhat higher – just over 60 percent). 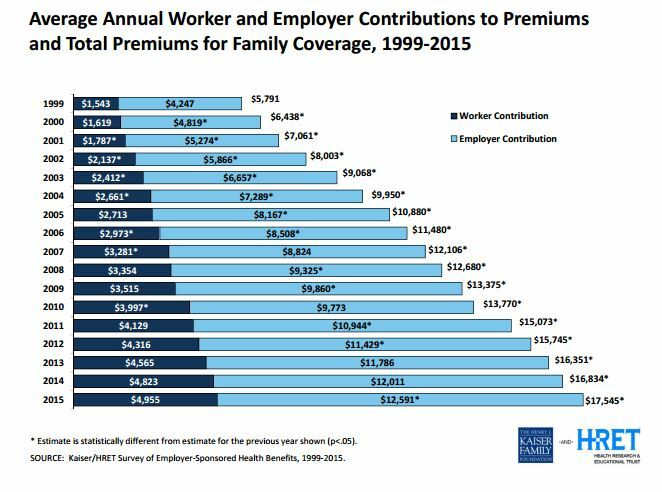 Of companies surveyed, the average annual 2015 premium for individuals was $6,521, while family coverage cost, on average, $17,545. This year’s 4 percent premium growth fits into a decade-long trend: Premiums have grown by an average of 5 percent per year since 2005, down from 11 percent per year between 1999 and 2005. On average, workers contributed 18 percent of their premium costs for individual coverage and 29 percent of premiums for family coverage, a level unchanged from 2014. This year, that amounts to workers paying, on average, $1,071 for single coverage and $4,955 for family coverage. Deductibles have become more common, and gotten bigger. This year, 81 percent of workers with employer-sponsored coverage have plans with a deductible that must be met before the plan begins paying for most services. That’s up from 55 percent in 2006 and 70 percent in 2010. Among those with deductibles, the average for individual coverage is $1,318, up from $917 in 2010. On average, workers at small companies face higher deductibles — $1,836 for individuals at small firms, compared with $1,105 at large firms. Since 1999, workers’ costs for health care coverage have far outpaced inflation and wage growth. 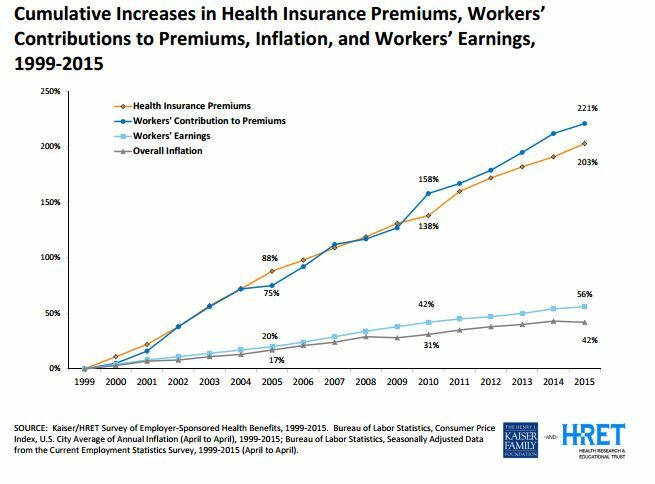 In that time, premiums grew by 203 percent, while worker contributions to their premiums rose by 221 percent. That compares to a 56 percent growth in earnings and 42 percent growth in inflation. This year is the first that employers with at least 100 fulltime equivalent workers must offer health insurance or face a financial penalty under the federal health law. The employer mandate extends to companies with 50 or more fulltime equivalent workers next year. The vast majority of employers with 100 or more fulltime employees – 96 percent – already offer a plan that meets the law’s rules, according to the survey. Among companies now subject to the mandate, 5 percent said they offered more comprehensive benefits to some workers this year, and 21 percent said they extended eligibility to workers who previously weren’t eligible for coverage because of the mandate. Some observers have questioned whether companies near the 50-fulltime-employee threshold will cut worker hours or eliminate positions to avoid being subject to the mandate. The survey found that among firms with 50 or more fulltime equivalent workers, 4 percent changed some jobs from fulltime to part time so employees wouldn’t be eligible for health insurance. Ten percent said they had done the opposite, changing some jobs from part-time to fulltime to make workers eligible for coverage. In addition, 4 percent said they reduced the number of fulltime workers they planned to hire because of the cost of health insurance. The health law included several other changes to benefits, including requiring plans to cover certain preventive services at no out-of-pocket cost to the member and imposing limits on out-of-pocket costs. “Even with these new requirements, most market fundamentals have stayed consistent with prior trends, suggesting that the implementation has not caused significant disruption for most market participants,” the authors wrote. The survey found one quarter of workers with employer-sponsored insurance are covered by plans that have not yet had to meet the health law’s requirements because they are considered “grandfathered,” meaning they have not changed significantly since the law was passed in 2010. A controversial provision of the federal health law known as the Cadillac tax is poised to require some employers to pay hefty taxes on their benefits. Although some members of Congress, including Connecticut U.S. Rep. Joe Courtney, D-2nd District, are pushing to eliminate the tax, as it stands it would require employers to pay a 40 percent tax on any insurance plan costs that exceed set limits. In 2018, those thresholds are $10,200 for single coverage and $27,000 for family coverage. In the Kaiser/HRET survey, 53 percent of companies with 200 or more workers said they had already examined whether they will exceed those thresholds, and 19 percent said their largest health plan would. Some have already made changes to their coverage in response to the tax. As pressures to rein in health care costs grow, one strategy many experts anticipate is the use of more selective networks, with health plans covering a smaller number of hospitals and health care providers, or stratifying providers and encouraging members to go to those deemed more efficient. According to the survey, 17 percent of employers that offer health plans have “high-performance” or “tiered” networks in their largest plan, which identify higher-quality or more efficient-providers and, in some cases, give employees financial incentives to use them for care. Those networks were particularly common among employers with between 1,000 and 4,999 workers, one-third of which used them. Fewer employers reported using narrow networks; 9 percent said they eliminated hospitals or a health system to reduce cost, while 7 percent have a plan considered to have a narrow network.